The Samaya Ubud is a tranquil sanctuary, set in a romantic location in Ubud, Bali, making it the ideal retreat for couples. It’s situated alongside the River Ayung and is surrounded by tropical gardens and rice fields. There are some fantastic activities to experience together, including biking, hiking, and nature walks. The hotel also offers plenty of activities for those just wanting to relax. Try sunset yoga classes in a peaceful atmosphere or enjoy the limousine rental and butler services. Your private villa is a luxury sanctuary, with its own private pool, set in peaceful surroundings. Enjoy a candlelit dinner in the evening and immerse yourself in the exotic local flavours or simply relax with a spa treatment beside the tranquil river in the day. Learn about the island’s fascinating culture with a Balinese Cooking Class at the hotel or spend a day exploring the nearby Monkey Forest Sanctuary. The hotel has 19 villas. Hotel child prices apply to ages 3–11 years. A beautiful restaurant which serves a diverse range of cuisine and overlooks the rice fields, mountains and volcanoes in the horizon. It also serves traditional breakfast and afternoon tea. 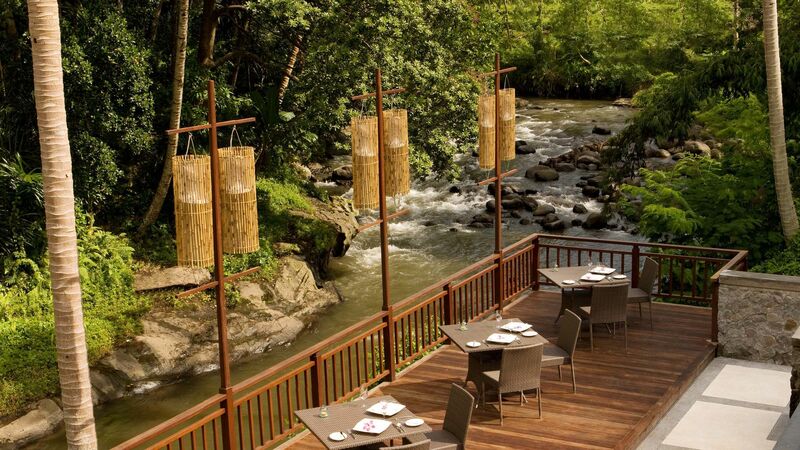 Enjoy award winning dining along the Ayung River. 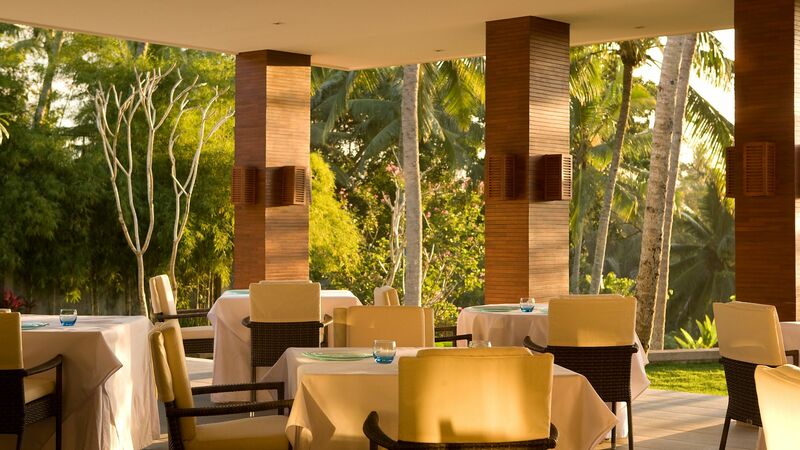 I Nyoman Wiratma, the Executive Chef, offers a superb menu serving authentic flavours made using fresh local produce. Enjoy a romantic candlelit dinner for two by the swimming pool, in your villa or at the Swept-away Restaurant next to the river. Celebrate together in the most romantic way. Settle down for a succulent four course menu served in your own private cabana, with specially selected drinks and wines, and pretty views of the pool. Indulge with this six course tasting menu, including premium wine and views of the breathtaking natural landscape. Candles and flower petals complete the romance of the meal. Located at the Swept-away Restaurant, exceptional chefs cook up an incredible seafood barbecue. Open: 18:00 - 21:00 on special occasions. Luxurious cocktails, mocktails and canapés are served at Scene Bar and Lounge every evening. Along the Ayung River lies a hidden spot where you can truly relax and immerse yourself in the natural surroundings. Enjoy a spa treatment right beside the river, then a three course picnic lunch. The spa is a sanctuary set in paradise. There are incredible treatments including the ceremony of the face and the ritual of touch, as well as a tranquil indoor swimming pool. There is a fully equipped gym at the Samaya Ubud, with advanced cardio and strength equipment for all your fitness needs. Sports and activities include sunset yoga, biking and hiking through the stunning natural landscape. This unique experience allows you to immerse yourself the authentic cuisine and succulent local produce of Bali. The classes are held in the Swept-away Restaurant. The Samaya Ubud is located in the centre of Bali, close to the town of Ubud. It’s surrounded by beautiful rainforests, rice paddies and streams; ideal for those wanting to explore the tranquility of the area. Ubud itself is a spiritual retreat with a unique culture. It is full of fantastic restaurants and streets of shops, as well as plenty of opportunities to explore. The Sacred Monkey Forest Sanctuary stands out as one of the best tourist destinations in Bali, and is located in a fascinating temple complex. Escape from traffic with the Campuhan Ridge Walk which takes you through rice fields and into a beautiful valley, perfect for sunrise or sunset walks. For spiritual awakenings go to the Lotus pond at Saraswati or explore the natural beauty of the area with a cycling tour. The Samaya Ubud is 90 minutes from Bali Denpasar Airport. Hillside Villas are approximately 392m² and are located either close to the Ayung river or at the upper level of the resort surrounded by tropical gardens. Ideal for privacy, Hillside Villas have their own private pool, furnished terrace and gazebo. Hill View Villas are approximately 392m² and have wonderful views of the rice fields and hillsides. Each villa features it own private pool, furnished terrace and a gazebo. The bathroom features a shower room and separate bathtub. Ayung Villas are approximately 292m² and are situated in front of the river. Each villa has its own private pool, funished terrace and gazebo. The Samaya Ubud Three Bedroom Villas are approximately 700m², and are the perfect choice for families and small groups of friends. Made for privacy you'll have access to your own full-sized swimming pool as well as an enclosed living space. The three separate bedrooms are complete with their own amenities. The Samaya Ubud Two Bedroom Villa is approximately 795m², and boasts its own private full-sized swimming pool. Situated in the middle of a tropical garden found in the resort's upper-level complex, you'll have total privacy in a beautiful surrounding. There are two separate bedrooms, with full amenities. Save up to 10% discount on the hotel price for bookings made at least 90 days prior to arrival for holidays between 27 December 2018 - 31 March 2019 (offer applies to all rooms). Save 10% discount when staying in a Hill View Villa, Hillside Villa or a Ayung Villa for holidays between 01 April - 26 December 2018 for bookings made at least 90 days prior to arrival. Honeymoon couples staying for a minimum of 2 nights receive a honeymoon cake, flower decorated room, flower bath upon arrival and a complimentary souvenir. Honeymoon couples staying for a minimum of 3 nights receive a 6 minute Balinese Massage. We visited the Samaya Ubud in March to start of our holiday in Bali. We need from the moment we stepped out of the taxi that we made the right decision on the hotel. Everything and I mean everything gets 10/10 from me. The villas are amazing, a home away from home! So much space and tucked away nicely from any noises for pure relaxation. I visited the spa 3times during my stay and I can safely say everytime just seemed to be better. The ladies in the spa work extremely hard to make your experience the best it can be! The food in this hotel was fabulous.. big selection on the breakfast menu (my favourite meal of the day) and there was plenty of choice on the dinner menu too! The staff at the Samaya Ubud are outstanding.. they simple cannot do enough for you! A special mention to Eddie who looked after us while we stayed here. The Samaya really really was the highlight of our holiday, I will always recommend it to anyone visiting Bali/Ubud and we will be back one day! Thank you, thank you, thank you!! We stayed at The Samaya Bali Ubud for 2 nights. This hotel is located in a ideal location. Surrounded by the luscious mountains and on the rivers edge. Each morning we had breakfast at the Scene Restaurant. Our breakfast was delicious with lots of food on the menu to choose from. The villa we stayed in was amazing. The pool was great, the room service was excellent. The hotel offered a free shuttle run to Ubud Centre and a pick up anytime available. The hotel staff were really lovely and friendly. I highly recommend the morning trek walking tour which takes place at 8am which is organised by the hotel. I?? ?m looking forward to coming back and staying at The Samaya Ubud on my next visit. 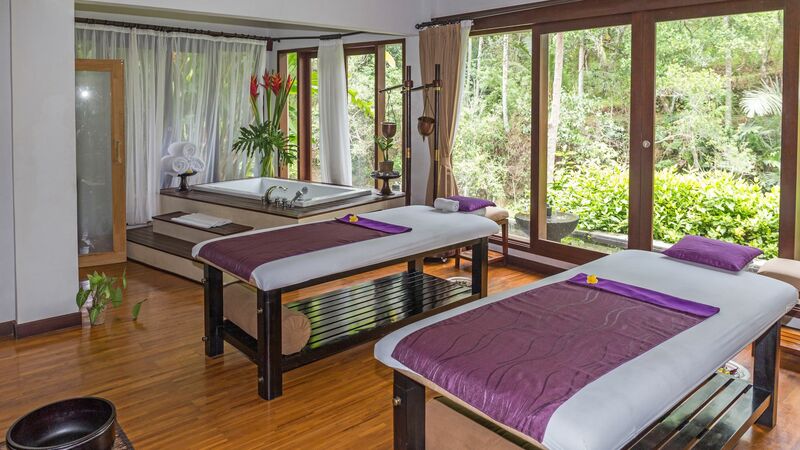 “ SAMAYA, UBUD: Never Enough! As an Indonesian who frequently travels to many countries, visits Bali many times, it may not be exactly easy for me to admire a resort like Samaya. During my short trip (24-26 March 2019), however, I really enjoyed my stay at this Luxury Villa Resort. Four reasons for this. One, my Villa 105 was not only like a ?? ?home away from home?? ?, but also gave a beautiful natural scenic view of Bali. Two, located across a wide 5 hectare land housing only 19 villas, it?? ?s huge, so huge that I never got a chance to see another villa. I was really secluded. Full of privacy. Three, the Breakfast ??? served at the Scene Restaurant gazing at Mount Batur in front and Paddy Fields below ??? was a luxury in its own right. One Hundred Candle-Dinner at Swept Away, by the Ayung River was the most romantic setting I ever saw in my life. Four, a tranquil spa complete with the natural sounds of Ayung Water is the best in Bali so far. And the most important is the Balinese hospitality of all Villa Crews led by Putu Mahendra. I will surely come back to stay in The Ayung River Villas at the Samaya, Ubud, which are being renovated now. Two nights are way too short. Never Enough!